Traveler Reviews for Private Tour in Amsterdam, Netherlands by Tour Guide Marianne D.
TOUR GUIDE RESPONSE: Thank you so much for this wonderful review! Just like you, I really enjoyed spending this Sundaymorning touring with the two of you! It was a great pleasure sharing my knowledge and exchanging our ideas. Thanks again! Marianne is a personable,engaging guide. We really enjoyed our time with her, walking along Amsterdam's city center. 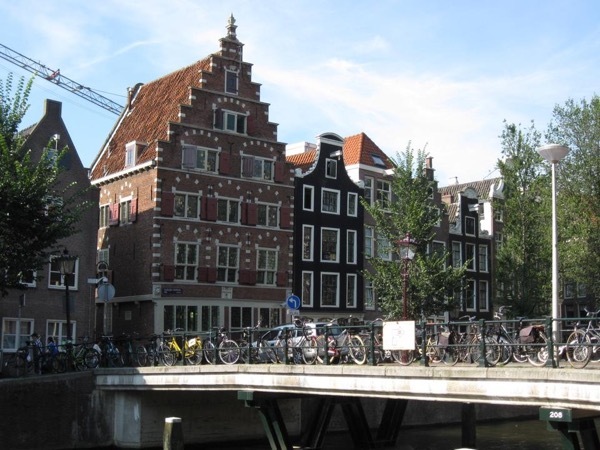 She shared much information about the medieval sections of the city which allowed us to gain a better understanding of Amsterdam's origin by the sea. We walked along the canals and through some narrow alleys, all along learning about Amsterdam's fascinating history and architecture. We enjoyed the 'secret' church in the attic of a 17th century home along the canal. We recommend Marianne. TOUR GUIDE RESPONSE: Hello Susan, Thank you for your review! I am glad you have enjoyed our walk of the medieval part of Amsterdam. I hope to see you again to show you the rest of our interesting city. Enjoy your cruise and the wonderful views of Iceland! Marianne was our tour guide for our group of six and she made each one of us feel that we were the focus of her attention. She was engaging, warm, friendly, and a consummate professional with a depth of knowledge that amazed us. Her historical knowledge, her stories and delivery style captured our attention and kept it. We enjoyed our last morning in Amsterdam with Marianne and would highly recommend her as your guide. TOUR GUIDE RESPONSE: Thank you Maryann, I am glad that your tour with me was a good way to end your trip to Europe. I enjoyed the company of you and your friends and hope to see you back! Tour was great. Marianne was a wonderful guide. I would highly recommend this tour. TOUR GUIDE RESPONSE: Just received this review, thank you for your 5 stars for last summer's tour! Wish you wonderful holidays this year! TOUR GUIDE RESPONSE: Thank you Bob and Patty, I really liked spending this afternoon with you. Hope you have enjoyed the rest of your European trip as well! And I won't forget going to see the architecture of Chicago! TOUR GUIDE RESPONSE: Thank you! I hope you have enjoyed the rest of your stay in Amsterdam after my short introduction on your first day. TOUR GUIDE RESPONSE: Thank you and enjoy the rest of your trip! Thank you for the enlightening walk through the old part of Amsterdam. You appreciate the same things that our family does - history, art, and politics. The Restaurant in De Waag is a place we returned to, along with the chocolate shop Puccini! The boat ride was very enjoyable. Thanks for your patience with us while we had jet lag and had to walk around in the rain. You really held our group together. Can't wait to tour with you again! We had a great tour. Wonderful information. Would use her again !! We saw interesting areas and had lots of fun too!! TOUR GUIDE RESPONSE: Thank you Stephen, I had a great day too. Would really like to do another tour with you and your party! I wish you and your friends a very good time on your interesting cruise, and good luck with selecting the pictures!!! Very knowledgeable of the City with great attitute to present specific details and information with a local perspective. We highly recommend her as a guide. TOUR GUIDE RESPONSE: Thank you very much for your comments! I hope you have enjoyed the afternoon in the Rijksmuseum! Enjoy the rest of your days in Amsterdam, kind regards Marianne. I had a wonderful tour of Amsterdam's historic sites by Marianne. She was an absolutely lovely person who gave a fantastic tour. She was incredibly knowledgable of the history associated with the city. She was also very flexible and worked to make sure the tour was tailored to fit my interests. I only had a brief stay in Amsterdam (less than 24 hours)--she made sure I made the most of my short visit! I will definitely book a tour with her again on my next visit to see more sites in this beautiful city! TOUR GUIDE RESPONSE: Thank you so much Janice. I am glad you will go home with a good impression of Amsterdam and I hope to see you back, as I really enjoyed the tour with you just as much as you did! Marianne was outstanding! Her enthusiasm, knowledge of the history of the city, and willingness to accommodate what we wanted to see was exceptional. Best tour we have ever had! TOUR GUIDE RESPONSE: Thank you Steve, I hope you will enjoy the rest of your stay in Amsterdam! Marianne provided our family that included two children ages 14 and 12 with a very enjoyable tour that helped us to learn about the history and development of Amsterdam. She also showed us very interesting sites that we would have never have noticed on our own.